Trunks: Straight, short, 1-2+ feet in diameter; crown rounded, somewhat open; branches few, large, often 20-30 feet above ground; branchlets many, slender, somewhat horizontal; bark on old trees thick, light grayish-brown, deeply furrowed ridged or with wart-like protuberances; ridges short, narrow; hackberry can sometimes be a gnarly shrub. 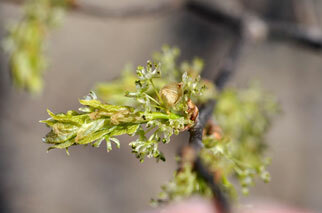 Twigs: Slender, zigzag, reddish-brown to gray or black, slightly pubescent; terminal bud absent; lateral buds egg-shaped, 1/4 inch long, pointed, flattened, pale brown; leaf scars small, crescent shaped; bundle scars 3. Leaves: Alternate, simple, deciduous, ovate to ovate-lanceolate, 2 to 4.8 inches long, 1.2 to 2.4 inches wide, thin; surfaces rough, yellowish-green above, paler beneath; margins coarsely toothed, entire at base; tip usually tapering to long point; base with unequal sides; stalk short, slender, pubescent. Flowers: With or soon after leaves, inconspicuous, male and female flowers on same branch; staminate flowers in clusters; sepals 5-6, yellowish-green, tips brown; petals absent; stamens 5; pistillate flowers usually solitary in upper leaf axils; calyx deeply 5-lobed, green; corolla absent; ovary green; stigmas 2, yellow, curved. Fruit: September-October; drupe, fleshy, spherical, 1/3 to 1/2 inch in diameter, dark orange to dark purple when ripe, edible; seed spherical, cream-colored; stalk slender, to 3/5 inch long; fruits can remain on tree through mid-winter. Habitat: Stream banks, flood plains, open woods, rocky hillsides; rich or poor soils; may grow on any site with sufficient moisture. Uses: Native Americans would dry and pulverize the fruit and use it to season meat. The bark was boiled and the liquid taken for sore throats and the inner bark was fed to horses. Sometimes hackberry is planted as an ornamental street tree. The wood was used for boxes and furniture. Comments: Hackberry is a highly variable species that can vary in size from a large to small tree or shrub. It is drought tolerant. The wood is heavy, weak, coarse-grained, pale yellow to nearly white. The leaves often have galls and disease sometimes causes dense clusters of deformed twigs along the branches.